The Vancouver Canucks hockey team are on their way to wining the Stanley Cup. CCEL students join in the celebrations as our team wins the series over the the Dallas Stars. The Canucks are now 5-4 in seven-game series. The Stars are just the third club Vancouver has eliminated since 1994. The Canucks visit the Anaheim Ducks tomorrow to begin the Western conference semifinal. 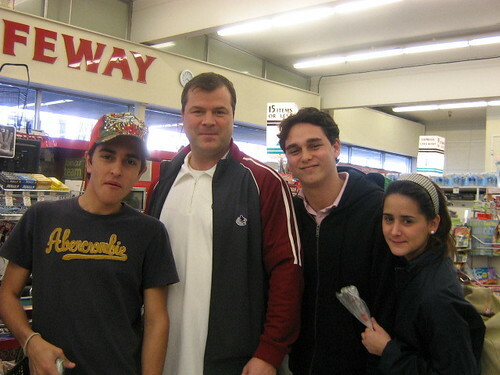 Three lucky CCEL students (Alejandro, Federico and Vivian) met Canucks Head Coach (Alain Vigneault) while shopping at Safeway. New 2007 Magazine ad distributed around the world. We invite you to visit us at our new campus Feb 2007 once the renovations have completed. This is the most exciting change to CCEL since we opened in 1992. CCEL has bought an apartment building and a neighboring heritage house on Robson Street and is now in the process of converting them into a new campus with a combination of college and student accommodation. The new facility will have state of the art classrooms on two floors, street level offices and internet cafe/lunch room, PLUS one floor of student apartments. The heritage house will be converted into a student residence. The location on Robson near Denman is the hub of student night life and is surrounded by a diverse range of ethnic restaurants popular with international students. Close to parks and beaches as well as right on Vancouver’s most exclusive shopping street, it is an ideal location. Our current location on Pender Street is to be demolished for a 35 storey tower. We expect to move to the Robson campus early 2007. One of the oldest and most reputable schools in Canada, the Vancouver YMCA International College, will be closing its doors October this year. The YMCA Vancouver is demolishing its present building to make way for a new 40 storey tower early 2007. Students from the YMCA International College in Vancouver will move to the Canadian College of English Language for their classes.